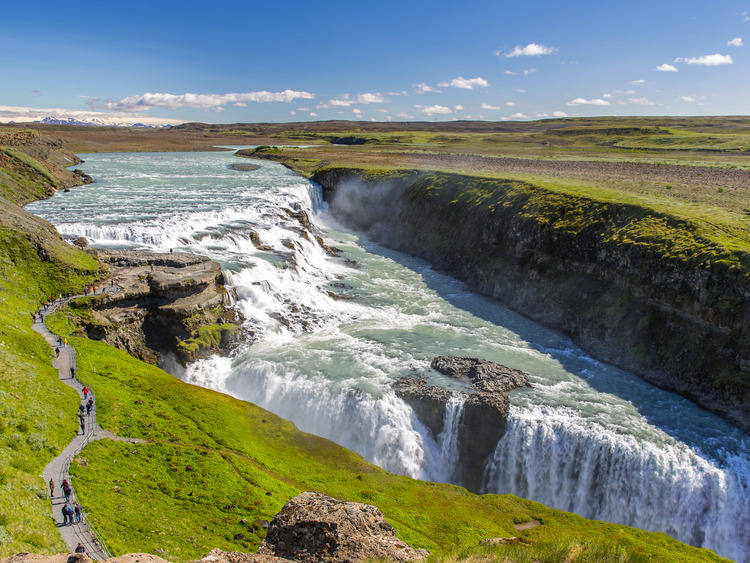 An excursion to the Reykjavik area, exploring three major local attractions: Gullfoss, Geysir and Þingvellir, the so-called "Golden Circle", to admire some of the spectacular panoramic views for which Iceland is rightly famous. We begin the day with a visit to the National Park of Þingvellir, or "Parliamentary Plains", as in the year 930 it hosted the first meeting of the Althing, one of the first (if not the very first) parliaments in the world. The Law Rock and the remains of the peat refuges are of particular interest. These building once hosted the participants of the Althing assembly, held for two weeks every other year at the height of summer. Just fifty or so kilometres from Reykjavik we are therefore plunged into a natural and historical gem and a UNESCO World Heritage Site. Inside the park we can immerse ourselves in one of the most evocative Icelandic landscapes, making Þingvellir one of the country's main attractions. The area is surrounded by mountains and encloses a volcanic plain covered with green moss and wild flowers. It is one of the many places considered sacred by Icelanders. Travelling alongside the largest lake in Iceland, the Þingvallavatn, we leave Þingvellir behind us and head for the Gullfoss, the "Golden Falls". The "Queen of all Icelandic waterfalls" has theatrical plays of light and two cascades into the tumultuous waters of the river Hvita which precipitates here for around thirty metres, forming two successive waterfalls and providing a breathtaking spectacle. We conclude the "Golden Circle" with a stop at the Geyser area where we witness characteristic gushes of water and steam, hissing springs and other geothermal phenomena. After lunch, served in this magical atmosphere, we return to Reykjavik.